austriamicrosystems introduces the AS5046, a new 12-bit resolution magnetic rotary encoder offering rotation, tilt and vertical distance detection of a magnet placed above the IC. The device can detect vertical distances over several millimeters, offering an ideal solution for contactless, multi-axis human interface devices, such as navigational knobs. The AS5046 is a complete system-on-a-chip, combining both Hall-elements and a signal processor on one silicon chip. In addition to rotation detection mode, the AS5046 also supports the detection of magnet tilt with push-button functionality. This opens attractive new possibilities in human interface applications such as joysticks. UNTERPREMSTAETTEN, Austria–austriamicrosystems (SWX:AMS), a leading global designer and manufacturer of analog integrated circuits (ICs) for communications, industrial, medical and automotive applications, introduces the AS5046, a new 12-bit resolution magnetic rotary encoder offering rotation, tilt and vertical distance detection of a magnet placed above the IC. The device can detect vertical distances over several millimeters, offering an ideal solution for contactless, multi-axis human interface devices, such as navigational knobs. 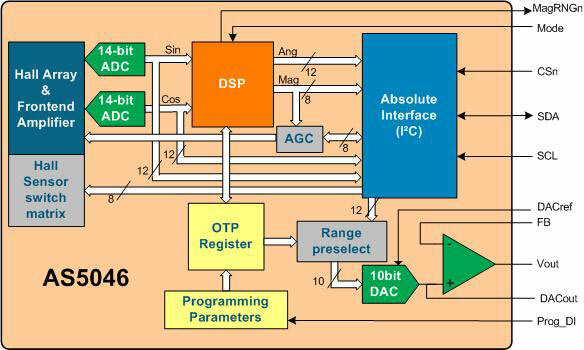 The AS5046 is a complete system-on-a-chip, combining both Hall-elements and a signal processor on one silicon chip. In addition to rotation detection mode, the AS5046 also supports the detection of magnet tilt with push-button functionality. This opens attractive new possibilities in human interface applications such as joysticks. “This innovative device is an exciting addition to our industry-leading magnetic rotary encoder portfolio. To implement the joystick functionality, users only have to replace the diametrically polarized magnet with an axially polarized one,” said Josef Janisch, Product Manager Integrated Magnetic Sensors at austriamicrosystems. “We currently work with selected customers on joystick applications based on the AS5046. The AS5046 allows users to build extremely small form factor joystick solutions for applications not only in industrial but also in consumer and communications markets”. The AS 5046 is the latest product in austriamicrosystems’ highly successful family of contactless magnetic rotary encoders, available in 8-, 10- and 12-bit resolutions, with different interfaces and for ambient temperatures of up to 150°C. The device communicates with an external microcontroller over a 2-wire serial interface. For standalone operation, the AS5046 provides a programmable ratiometric analogue output. The AS5046 is available in a lead-free SSOP16 package. It can be operated at either 3.3V or 5.0V supply and is specified for -40° to +125°C ambient temperature. Samples and demo boards are available immediately. Detailed application notes are available along with demo boards and free software tools to facilitate customer designs based on the AS5046. 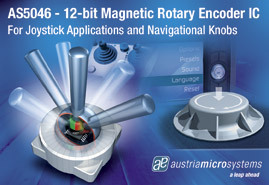 More product information can be found on the austriamicrosystems’ website at http://www.austriamicrosystems.com/03products/20_rotary_encoders.htm. austriamicrosystems is a leading designer and manufacturer of high performance analog ICs, combining more than 25 years of analogue design capabilities and system know-how with its own state-of-the-art manufacturing and test facilities. austriamicrosystems leverages its expertise in low power and high accuracy to provide industry-leading customized and standard analog products. Operating worldwide with more than 1,000 employees, austriamicrosystems focuses on the areas of power management, sensors & sensor interfaces, portable audio and car access in its markets Communications, Industry & Medical and Automotive, complemented by its Full Service Foundry activities.